I love the Roadrunner and Wile E. Cyote Cartoons, everything about them brings back good memories: sitting with my Grandfather on a Sunday afternoon watching Bullseye or Wrestling with Big Daddy, and suddenly there'd be a Tom and Jerry or Pepe Le Pew Cartoon bunged in the gap between shows. But my favourite was always Wile E. Cyote and his long drops into oblivion. I was never particularly a fan of Roadrunner himself and always sort of rooted for the underdog...but it was still a great laugh when poor old Wile fired himself into the floor using a gaint rubber band. 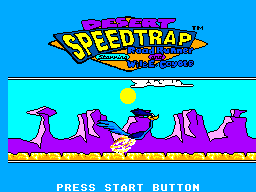 So when I got the game and found myself controling that blue, tongue poking, beeping, S.O.B., Roadrunner I began to wonder if the reason I kept dying was because of a subdued, but ever prevelant, lifelong urge for Wile to get his hand tound that skinny feathered neck. Was that the case or was something more sinister at work? As I've already mentioned above you take control of Roadrunner as Wile E. Cyote makes constant, ill advised, attempts to crown his feathery adversary. So how does it all play out, well firstly you're constantly under a time limit and forced to bomb it around your parched surroundings collecting stars - each worth one seconds worth of time on your ever decreasing limit - dodging carniverous plantlife, spike launhcing desert crabs (?) and deadly tumble weed...why it's deadly I have no idea but there it is. 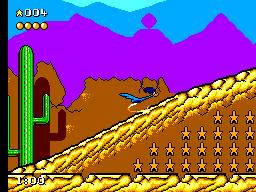 If you manage to jump on one of these ridiculous harbingers of doom, except the carniverous plants which are invincible for some reason, you may be granted one of the few power-ups on offer which include temporary invincibility, some much needed time or a rocket charged boost to your speed. Also at various points throughout the levels you will find robot guarded teleport devices that will send you to a horde of isolated stars that you'll have a short span of time to try and grab. Once you've bounded through the desert for a little while you will be confronted by Wile E. Cyote sporting some moronic device with which he hopes to smash the life out of you with so he can fill his fuzzy little belly. Can you dodge his attempts by bus, rocket and other means to destroy you or will you be on his plate, steaming, by dinner time? Well that all depends on wether or not you can traverse some of the worst level design I've encountered, and cope with some of the slipperiest, Sonic wannabe, controls the system has to offer and make it to those all important bowls of life giving bird seed. The graphics aren't too bad and stick closely to their source material. For example you will enevitably be legging it around the, all too familiar, desert surroundings the cartoons where set in, but not only that, every so often Roadrunner will let out his recognisable beeps as he is animated with all the vim and urgency of the 'toons. 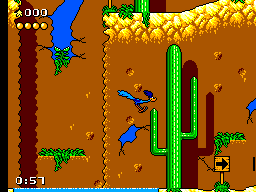 One of my favourite little touches is when you run off a cliff and Roadrunner pauses in midair and looks at you before plummeting to the earth. Other than these little touches, such as Wile's inevitable humurous dimises, the graphics are bright, don't clash too badly and are relitavely free of flicker and slowdown which, conscidering the speed at times, is no mean feat. Good use of the liscence lends to familiar tunes and great crunchy sound effects. Sweet. This is one major blight that I just can't overlook. The controls are slippery, unreliable and overly sensitive. Jumping is, at times an inaccurate nightmare which can lead to you landing just at the side of an enemy you where trying to land on which will usually end up with you looseing some health or, worse, a life. Bad, bad, bad stuff. It's not the worst game out there and if you dig platformers you'll certainly give it a chance, but my bet is you'll feel like flinging it at the wall before you ever get used to the flimsy controls. Flimsy controls and unchanging environments may put even the most hardened platform fans off for life. I stuck with it to what I feel was near completion but I just couldn't bring myself to go through it all again. Perhaps one day i'll give it another crack, but most likely i'll just play Wonderboy in Monsterland, Sonic or one of the infinately better Donald or Mickey games, which is also what I recommend you do too.